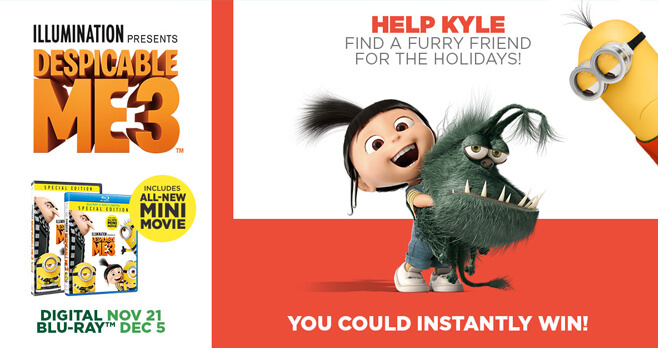 Visit www.dm3kylesfriend.com and enter the Despicable Me 3 Find Kyle A Friend Instant Win Game for your chance to win hundreds of prizes including Despicable Me 3 DVDs and Blu-ray discs, soundtrack CDs, Stuart Minion Plushes and more. Who Can Enter? The Despicable Me 3 Find Kyle A Friend Instant Win Game is offered only to legal residents of the 50 United States and the District of Columbia, who are at least 18 years of age at the time of entry. When To Enter? The Promotion begins on November 7, 2017, at 12:00:00 PM ET and ends on December 8, 2017, at 11:59:59 PM ET. What Are The Sweepstakes Prizes? Prizes include Despicable Me 3 DVD, Despicable Me 3 Blu-ray, Despicable Me 3 soundtrack CD, Tumblin’ Stuart, Stuart Minion Plush and more. Who Are The Winners? To obtain a list of the names of the winners, mail a self-addressed, stamped business-sized envelope to: The Despicable Me 3 “Find Kyle a Friend Game” – Winners List Request, P.O. Box 251328, West Bloomfield, MI USA 48325. Winners List requests must be received by February 6, 2018.